More visits coming soon! Please sign the waiver and mail to Marin Organic. ***NEW: We have joined "Meetup". Cost to maintain Meetup is $144. annually. We are requesting a $5. donation on that site, which appears as "Membership Dues". You are not required to pay this to join, but it is suggested to off-set out-of-pocket costs to the volunteer coordinator. Click here to join the "Art on the Farm" Meetup Group, which will alert you of upcoming Farm Visits this year and allow you to arrange car pools with other artists share your art and more. If you are a painter, you may also want to become a member of the North Bay Plein Air Meetup Group for monthly paint outs around the entire Bay Area. These are not part of Art on the Farm, but many of our members attend these dates regularly and you may meet an old or new friend there. Artists! 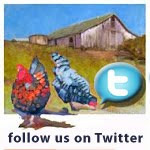 Visit here to sign the farm visit waiver from Marin Organic. Please contact founder Alan Mart to be included in an upcoming visit.